Full list of equipment below! 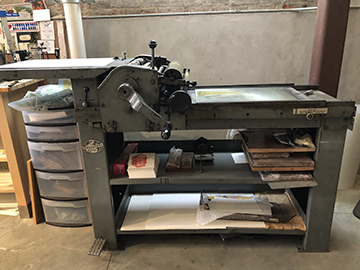 Everything you need to start your own printshop. These items are all sold together and must be picked up by the buyer. All the equipment is stored in a clean, dry building in New Orleans, LA. 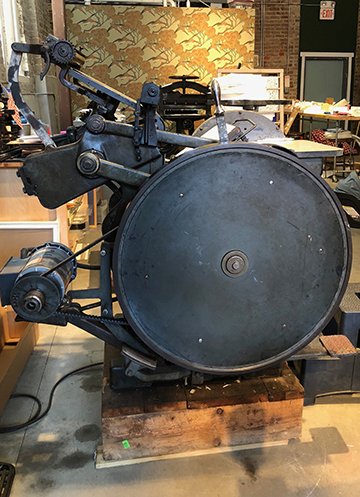 They have all been used by a functioning letterpress shop (that’s still in business!) for four + years and have been well taken care of. New rollers when purchased four years ago. Large Boxcar base included. 1.5 yrs old with no dings. series. Serial no. NB 209; Manufactured in 1905. New rollers when purchased four years ago. New motor added by electrician when purchased four years ago. 1 - Hamilton Galley cabinet. 100 galleys, 9 x13² Serial # 17C62-C83313; Many containing miscellaneous type & leading. 1- Hamilton Galley cabinet. 52 galleys, 6 x 24” Serial #C13546-2-48; Most containing miscellaneous cuts and ornaments: religious, Christmas, fonts of standing new type, large assortment of dingbats. 1 - Tubbs double type cabinet. 48 California type cases. Green painted oak; with center galley rack. Includes various sizes of Bernhard Gothic, Brush, Park Avenue, and other typefaces. Includes homemade leading case on top. 1- Hamilton type cabinet. 24 California type cases, mostly empty. Varnished oak. Cases contain miscellaneous types. Serial # 79634. With electric light. 1 - Hamilton 3Ž4 size type cabinet. Varnished oak. 20 California type cases containing miscellaneous Caslon types. The two presses are mounted on wooden bases that allow for easy moving with the hydraulic lift. We are asking $17,000 for the whole lot, but also happy to discuss reasonable offers. Can take as many pictures as you might need! Just let me know.